While it is important to have an understanding of business fundamentals, there is no blueprint for entrepreneurship. It’s beneficial to think outside the traditional paradigms. 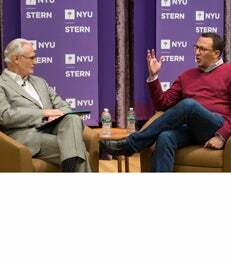 Philip Krim, co-founder and CEO of Casper, joined MBA students and alumni for a 2015-2016 Langone Speaker Series event, presented by U.S. Trust. Professor Jeffrey Carr moderated the discussion, beginning with a one-on-one interview and followed by an open Q&A session. Krim, who had worked previously in the mattress industry, was inspired by the business models of Warby Parker and Dollar Shave Club. Along with four co-founders,. Krim used his background in digital marketing, introducing innovative marketing techniques to the classic marketing mix. Casper started running subway ads, a non-traditional channel for the market, to tell the company’s story and attract new customers. Krim noted it was the perfect way to increase brand awareness and tap into their target market. Looking towards the future, Krim says Casper is looking to expand globally, specifically in Germany and the United Kingdom. He also hinted at the development of new products that will blend both the tech and mattress industries. His ultimate goal is for Casper to be the go-to brand to help people sleep better across the world. How will Casper achieve this goal? Krim says by staying at the forefront of the conversation around sleep. When starting a company, find the right advisor. Advisors are incredibly valuable to any organization. Build your team based on the culture you have set for the company. Don’t be afraid of the competition. This Langone Speaker Series event was co-hosted by Stern's MBA Office of Student Engagement & W. R. Berkley Innovation Lab.